Teasdale in Merry! Back in Stock! Plus an OCD Addendum. Just when I thought I was done for the day... The Ace & Jig Teasdale Dress in Merry is back in stock at Life:Curated in size Medium! OCD Sidenote: I really wanted offset stripes like the ones above, and sadly the one I'd tried on at Bird didn't quite cut it, with its not-quite-matched-not-offset-enough striping. HOWEVER, I've figured out the trick for guaranteed mismatching stripes — at least I'm pretty sure. The bottom tier of the Teasdale appears to be constructed simply out of two rectangles of fabric — no shaping. This is important because, if you notice the stripes on the dress above, the colors on the two tiers go in the opposite sequence. Which means the bottom tier was sewn on upside-down in relation to the top! Whether that was done in error or by intent is unclear, but replicating that would be incredibly simple for those of you with basic sewing skills (and there are so many of you who are SO skilled! ), and a pretty simple request for any seamstress. So yep, I'm 100% on Team Teasdale now, and I'm not mad about it! 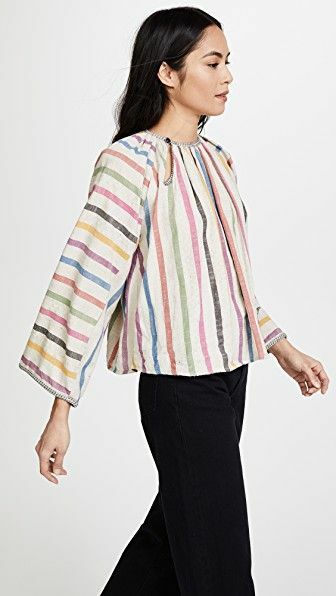 The Joni Mini in Merry didn't work for me at all, as the ones I received ran very large in the bust (Joni sizing has varied so much across the different textiles for me! ), so this idea came right as I was lamenting what appeared to be my un-Merry fate. Bwhahahaha!!!!!! Listen lady, you ask for a gif, you get a gif! You deserve it for all the hard work you've been doing on this here blargh! Always thrilled to read your pithy ponderings.